Shark is one of the famous brands in UK that offers incredible vacuum cleaners at an unbelievable price. So, if you are looking to purchase a new hoover, then there is nothing better than a Shark. Keeping the same fact in our mind, we are presenting you seven of the best Shark vacuum reviews. Read about them, check the features and functions and then you can easily select one of them depending on your preferences and requirements. Let us dive into the water. What to Look for in A Shark Vacuum? Is the Shark Vacuum Better Than Dyson? With so many Sharks to consider in the market, we thought to round up the top three of them. Perfect to keep your house dust free; the first one is the overall best, then comes the best battery operated and finally the best pick for budget buyers. Shark NV801UK: With Lift-Away body and DuoClean head & HEPA filtration system, NV801UK is our best choice for carpet & hardwood floor cleaning. The vacuum offers useful and versatile cleaning that also without making much noise about it. 750W powerful motor and a long rage of accessories add to its value. Shark Upright NV681UK: We love the unrivaled versatility and effective floor head of NV681UK, which gives you desired cleaning results on all the floors. The quiet yet powerful 750W motor offers strong suction but never lets anyone know that you are cleaning the house. The hoover is lightweight and comes with an 8m long power cable, which gives you enough reach around the cleaning area. Shark Cordless Stick IF250UKT: A powerful all-rounder vacuum that has an impressive run-time and also comes with two rechargeable batteries. HEPA filtration promises zero allergens and efficient DuoClean head of IF250UKT offers unmatched suction. It also has a set of LED lights that illuminate dark areas as well. IF250UKT is a super versatile a hoover for all floor types and this is the reason why it is one of our top three recommendations. Let us welcome the first shark hoover in our lineup, which has a DuoClean head, versatile Lift-Away body and is silent like a leopard on a hunt. Yes, that is right, being a Shark, it also is also hushed like a hunting cat. NV801UK does its business with the help of two rotating brush bars attached with its DuoClean head. Soft flock roller leads the charge, and a traditional bristle brush follows. Both of them are powered by a separate motor and revolves in the same direction. You can use the switch located on its handle to run the brushes at full speed on carpets and slow on hard floors. However, the brushes are not extended to the edges, so the cleaning width is smaller than the real head. The pair of brushes does well in picking up all kinds of dirt and debris. Also, they can be easily removed for cleaning. You also get a hair-removal tool under the top cover. See, these are the reasons why this vacuum is our top pick. Nothing can come in front of the cleaning power of NV801UK. Low noise is one of the significant points, but that is a luxury because the star feature of the vacuum is its DuoClean floor head. Its dust storage capacity may be less, but the vacuum offers brilliant cleaning on all the surfaces and materials. Floor head is very nicely segmented at its neck. Without being too big or heavy, the head efficiently clears dust from the hard floors and spillage from carpets. You can use the vacuum as an upright or in a Lift-Away mode with the floor head attached with the central unit. The feature gives you the ability to clean the spaces under beds and furniture easily. For those dark areas, the vacuum features a set of LED lights that are even better than a Beetle headlamp. The only significant problem here is the bin. It may look more prominent due to other components, but it is tiny. At mere 0.5 litres of capacity, the container gives you the pain to empty it regularly. It is irritating because NV801UK is a great cleaner that picks up all kinds of dust, but you have to empty the dirt at regular intervals. Here comes our second entry of this list – NV681UK, which is smooth and quiet, but is it compelling enough? Let us check the same. With a solid floor head and useful Pet Power Brush, the NV681UK never misses any dust from the floor. With unrivalled versatility, this vacuum is capable of any cleaning job. Open the packaging box, and you will see a range of accessories that you will not be able to count. Accessories are the secondary part, but first, we should discuss the central unit, which is also a Lift-Away section. This section includes bagless bin assembly, filtration and motor. You can use the primary/central unit like a cylinder cleaner, but with attached hose and tools. Sculpted handle at the top makes the movement easy and a flat base means that it can stand on its own. There are no wheels to move the vacuum, but at mere 3 kg, it is easy to carry. With a length of 8m, its power cable gives you easy access to the cleaning area. 750Watts EU-complaint motor is a lot quieter than most of the vacuums. We are not saying that it is the most silent vacuum, but with such versatility and power, it only has an 80dB noise output. There are quieter vacuums available in the market, but none of them has the versatility like NV681UK. For dust emissions, the vacuum gets an A rating. Why? Because it has a comprehensive filtration. Anti-Allergen Complete Seal design shows that there is a gad gasket to all the parts exposed to dust. The bin is easy to empty but has a low storage capacity. It looks big, but most of the area is occupied by the cyclone assembly. So, be ready for frequent emptying. A powerful vacuum that gives an all-round performance with long runtimes, IF250UKT also comes with two batteries promising and uninterrupted cleaning session. A folding tube, dedicated pet hair removal tool, HEPA filtration, and LED headlights on the DuoClean head are its other considerable features. Even with complete power, it works for 24 minutes and gives impressive results. Pistol grip of the vacuum and its versatility of changing modes from stick to handheld gives you some severe cleaning performance. Also, the floor head works on the carpets and hard floors alike, so you are assured of having a dust free house. With twin motorised brush bars, its DuoClean floor head works like a beast and also has eighth LED lights. The front soft-flocked brush bar picks up the dust and debris from the hard floors while traditional carpet-cleaning bristles are at the rear. Two large wheels give you an easy manoeuvre, while the neck turns and tilts for better access to areas around furniture. What makes the IF250UKT easy to use and store, is its innovative folding tube. It allows the head to quickly get under the low obstacles so that you can deep clean the spaces under the bed, sofa and other furniture. The vacuum comes with two batteries, that can be charged on the supplied dock attached with the cleaner’s body and even on their own. It has two power settings and a couple of brush-bar speeds for the powerhead that gives you different runtimes. The vacuum feels a little heavy, especially while cleaning the cobwebs with one hand. Its main floor head also tends to move forward. If you have pets and you are looking for a new vacuum, you should have a look at Shark HV390UKT – a compact and easy to manage cleaner that gives you excellent results. Shark hoovers are well constructed, and HV390UKT is no different. Once it arrives, you will see that each component is very nicely wrapped and you can quickly assemble it in no time. With Life-Away technology you can easily convert this Shark hoover into a handheld from a regular upright mode. Transformation is also effortless; you only have to detach the lightweight pod from the vacuum head. With carefully designed tools and attachments, you always get unmatched cleaning results. Using its extended reach mode, you can quickly clean ceilings, curtains and all the other over the head areas. Overall, the vacuum gives you complete freedom, versatility and reliability while housecleaning sessions. The HEPA filter and Anti-Allergen Complete Seal Technology are the most significant features of this vacuum, which captures 99.9 per cent of the allergens and never allows them to get back into the air you are breathing. If you have asthma, then this can be the first option that you should consider. 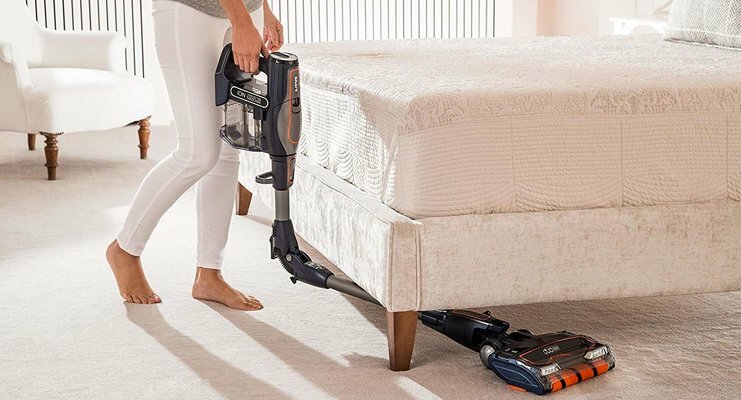 Another unique feature of the vacuum is its DuoClean Technology wherein two brush rolls work together to produce excellent cleaning results both on hard floors and carpets. With a couple of settings to choose, you can banish all the dirt and debris out of your house. The vacuum also comes with a pet power tool that takes care of pet hair, even the stubborn ones. Swivel steering and low weight of the vacuum makes it more flexible, especially in tight spaces while the bright LED lights illuminate dust particles in dark areas. On few surfaces it drives forward without any input from the user. The real difficulty is to pull the vacuum backwards, as you have to overcome its forward-moving force. Flexible tube and folding mechanism add to its weight. You feel the gravity while cleaning cobwebs on high corners and celling. Lumps on animal fur get caught between the transition from the cyclone to the dust canister. You need to get your fingers dirty to remove all of them. Another extraordinary vacuum from Shark, NV601UK is versatile and powerful yet has relatively less weight. Using Lift-Away technology, it quickly transforms into a handheld, so that you easily clean stairs, ceiling, curtains, and other over the head areas. The vacuum goes from carpets to hard floors with ease and conveniently reaches tight spaces as well. Its central pod is convenient to detach so that you can use it as a handheld. Once converted into a portable unit, its weight decreases further, so you can easily carry it anywhere whether it’s your garage or the basement. With advanced swivel steering, it gives you easy cleaning around the house, especially around the beds and furniture. With an extended power cord of 8 meters and comparatively low weight, especially in the handheld mode, gives you great access and reach around the cleaning areas. Bright LED lights illuminate the cleaning area as well. While cleaning the carpeted and hard floors at the same time, you can quickly change the mode via a switch located conveniently above the dust canister. There is nothing to dislike about the vacuum. Our teams tested and each of the members gave five-star ratings to the cleaner. With endless features, Lift-Away TruePet IC160UKT Cordless cleaner delivers unmatched versatility, extended runtimes and reliable cleaning. Shark’s first cordless vacuum, the IC160UKT comes with many innovative features, but in a single battery powered design. Its efficient DuoClean head offers dependable upright or cylindrical cleaning. On Boost mode, the suction power of the vacuum enhances to a great extent, and you can quickly clean a heavily soiled carpet within a few passes. Look at its name, and you will know that the IC160UKT falls in the upper category of vacuums offered by Shark. The vacuum is an all-around performer. With Lift-Away section, you can use the vacuum in three different modes including regular upright, combined and handheld; the vacuum is as versatile as you can expect. If you want a vacuum that clean any surface, any material or anything in the house, then this can be your choice. It hides at a weight of 5.6 kg, and we can say that it is easy to carry. In lift away mode, its weight tips at 2.5 kilograms, which sets the scale high for cordless vacuums. The charging time is very high. Its cleaning capacity is below par if compared the same cleaning performance of other vacuums available at the same price. We agree that IC160UKT is a beast looking vacuum, but a small dust storage capacity of 0.6 litres is a letdown. It also seems huge and stylish to use, but we doubt that it can be a feast to everyone’s eye. Powerful, yet amazingly quiet SV75Z has an attractive design. Long and shaped precisely like a shark, the vacuum has a very sharp appearance. At 28 inches, this is the longest cleaners we have reviewed. Comes with a one-year warranty, wherein you can get help from the FAQs on their website, live chat support, knowledgeable customer support and e-mail help. So, even if you have a small query, you can chat with a support analyst. Due to a comfortable handle, its length never troubles you while cleaning. Its sleek design helps you to easily carry around the house, to your garage for cleaning/vacuuming the car interiors. The vacuum is battery powered; you do not have to always look for a nearby outlet. You can take it outdoor as well, on camping or road trips. It also has a dust canister which is easy to empty. As SV75Z is a bagged vacuum, you do not have to purchase dust bags at regular intervals. No need to spent much time on the maintenance as the filter is easily removable and washable. One of the attractive features is the range of accessories it comes. There are all the attachments that you need while cleaning your house. Also, it comes with a wall mountable charging cradle, that gives you secure storage. Just leave it for overnight charging and use it for the morning cleaning session. There are no clogging troubles as cyclonic cleaning system of the vacuum circulates the dust and debris in the right manner. Thus none of the soil gets to the filter. It also adds to suction strength of the vacuum until you empty it. The vacuum comes with a motorised dusting brush and crevice tool for tight spots. Its broad dusting brush easily picks up all the animal fur, and that’s where the vacuum gets its name. It’s not necessary to use the attachments; you can always use the direct suction if that works best for the material or surface you are cleaning. Yes, the vacuum is powerful, but still, it takes more than a few passes to clean soiled carpets. We agree that the vacuum is sufficient on most of the dust and materials, but not up to the mark. Still, you get the value of your investment. Noise level. If a vacuum makes lots of noise without giving much power or cleaning performance, it is better to have a quieter one. They are bagged or bagless. A bagged vacuum needs replaceable dust bags while a bagged one seals the dust for you in the canister and you have to empty it. So, choose what suits best according to your preferences. Both the types have their negative and positive aspects. Requirements. Analyse your needs and check your preferences. Example, if you are a pet owner, look for a vacuum that has the suction power to clean all the animal fur. Similarly, if you have carpeted floors, find a vacuum that cleans well on carpets, without extra passes. Anti-allergen. If you are allergic, you should look for a vacuum with a HEPA filter. Such vacuums make sure that your house is free from allergens. Weight. If you are living in a multi-floored apartment, weight is another critical factor to consider. It may be difficult for you to carry a heavy vacuum in a big house, so investing in a lightweight variant will be better. After reading about the top seven Shark vacuums, we are sure you will find something that will suit your requirements. Now, you must be thinking about the amount that you should invest in a vacuum cleaner. Well, handheld vacuums fall on the lower end of the price scale. As they have limited functionalities as compared to regular upright or cylinder vacuums, you can find handhelds even under £100. Then comes the vacuums with Lift-Away technology. You can get that at an inexpensive price tag of £150, but if you want some high-end features, then you will end up paying anywhere around £300. Ultra-light models are the most expensive ones, you can get the corded vacuums for £150, but if you need a cordless variant with a pair of batteries, the price can go up to £300. Price. Dysons are more expensive then Sharks. Weight. Another area where Dysons are unable to compete is the mass. The vacuums from Dyson are heavy as compared to Shark. Warranty. Flagship models from Dyson come with a guarantee of 5 years, while those of Shark has 7 seven years of warranty. Cordless variants from Dyson has a warranty of 2 years, but Shark offers a warranty of 5 years. As you can see, Shark is a clear winner over Dyson. However, you should also know that Dyson is better than most of the vacuum brands in terms of performance, warranty, durability and price. Most of us are fearful of sharks, and there are good reasons to be afraid of them. They are powerful and possess a capacity to overpower any other fish or human under water. We are giving you an introduction about sharks because the brand and its products that we are going to discuss today also have the same name – Shark. The brand manufactures versatile vacuums cleaners that are strong and fast like shark fish. Also, they are easy to operate and convenient to use. We have given you our best pick, NV801UK. It has the Lift-Away mode and many other features that none of the other vacuums from any other brand can offer. Out best budget pick NV681UK comes with Lift-Away feature that you will not find at such a low price. Now, it is your turn to purchase a Shark that suits best to your requirements and terrify the dust particles in your house. Happy cleaning.